In fact, I thought I’d covered everything I possibly could until this past week, when a delinquent client tried to convince me that he shouldn’t have to pay me the full fee we’d agreed upon. I’ll spare you all of the nasty / shady details but, basically, because of a single day in which I’d lost power during the whole Hurricane Sandy fiasco, this client was insisting that I didn’t deserve my full fee. When I ranted about the situation to my closest word nerd posse, I learned about force majeure, a contact clause one can include to say that both parties won’t be liable if an event beyond their control — such as an effing hurricane — makes it impossible for them to fulfill an obligation. “I just read about it in The Freelancer’s Bible,” said Susan, ever the voice of wisdom and reason. I’d just received my own review copy of the book the week before, and this spurred me to finally dig in. I paid particular attention to the section on contracts, which laid out every damn thing one should include in one (I’m tempted to rip these pages out and hang them above my desk), and then gave tips on how to resolve disputes. As I pored over these pages, I swear I heard a chorus of angels harmonizing from up above. new. 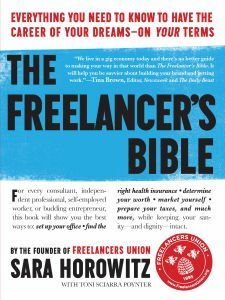 Things are no different with The Freelancer’s Bible, written by Freelancers Union founder Sara Horowitz. And though I appreciate the title — which hints at a comprehensiveness unseen in other books of its kind — I’d go so far as to say that Bible isn’t the best choice of wording. Rather, I see it as a toolbox. One with levels. On the top level is all that beginner stuff: How to set freelance goals. How to set your rates. How to set up the ideal office environment. Beyond that is the next-level stuff: Getting clients. Closing the deal. Marketing yourself. Networking. (I especially loved a section on balancing your freelance portfolio — finding the right mix of client types in order to feel fulfilled and succeed as a business.) Finally, if you dig deeper into that toolbox, there’s all that other stuff that may not have occurred to you yet: Subcontracting. Taking on business partners… or perhaps even an entire team. Incorporating. Continuing education. For now, I’m just highlighting THE ENTIRETY OF THE SECTION ON CONTRACTS. But I know I’ll be able to turn back to this book when the other nitty-gritty aspects of the freelance life elude me. Speaking of contracts, have you tried the Freelancers Union Contract Creator? Such a fabulous resource! Especially when you’re setting up you’re very first homegrown contract template. So over the course of your freelance career, which contract clauses have you regretted not including? Thanks for the shout out! In an ideal world, you shouldn’t need that clause. I mean, what reasonable would screw you over after a hurricane? It just seems like common sense to cut the other person some slack. I just ordered myself a copy of The Freelancer’s Bible because – don’t hate – I’ve never really had to write up a contract for myself. Most of what I do for the big media companies involves their standard contracts, and for book stuff, I sweated out finding an agent (to whom I will happily fork over 15 percent to have someone negotiate contracts for me!). If I ever had to do one myself, I’d be screwed. And I don’t want to be screwed. Contracts: Our least favorite part of freelancing. Thanks for the reminder. If I’m honest, I’d say a bit of my fear about contracts is that when I present one with all the “you’ll turn over your first born if…” clauses, the client will walk. But really, I’ve signed contracts to buy homes and obtain an SBA loan (super scary clauses!–don’t do it!). 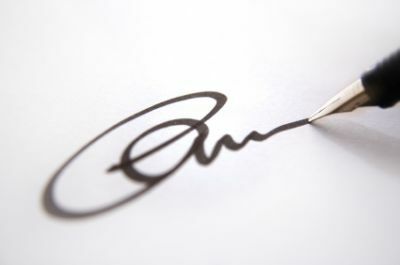 Our clients, if they’ve been in business for long at all, will not think twice about signing.